Deep within the ancient fortresses of Terrinoth stand ancient stone guardians, ever vigilant. Only awakened by Lords and Wizards who know the secrets that can imbue the golems with life when the need is dire. The strength and ferocity of these golems knows no equal, scything their massive blades through infantry and cavalry with ease. Rune Golems will stop at nothing to destroy the enemies of the Daqan, and then return to their hidden slumber until called upon again. 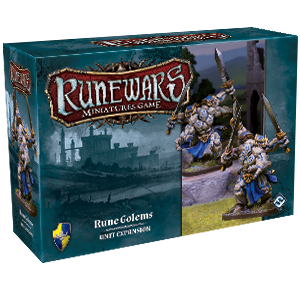 The Rune Golems Unit expansion features two Rune Golem Plastic Figures, one sculpt new to this expansion and one identical to the Rune Golem sculpt found in the Core Set, as well as eight upgrade cards to help you build your army anyway you choose. Crush the enemies of Daqan beneath your feet with the Rune Golems Unit expansion. Fire poisoned arrows down on your enemies with eight new Reanimate Archer figures included in the Reanimate Archers Unit Expansion!